Local Food – What Could Be Better? 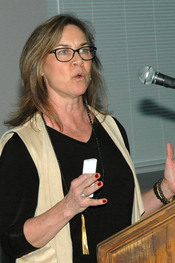 Kristen Suokko served as Board of Directors chairwoman of the Local Food Hub in 2012, and in 2013 became executive director. Kristen spoke at our February meeting on the value of fresh, farm sourced food from local farms. The program was moderated by SSV board member Madison Cummings. Listen to her presentation via podcast. Local Food Hub is a nonprofit organization that partners with Virginia farmers to increase community access to local food. They provide the support services, infrastructure, and market opportunities that connect people with food grown close to home. Local Food Hub grew out of a community-supported discussion that identified a need for greater linkages between small family farms and institutions seeking local food. Farmers were being locked out of the institutional market due to missing infrastructure, delivery minimums, insurance requirements, and time. Institutions and businesses found it challenging to access a consistent supply of local produce, and were looking for one number to call to source locally. Since its founding eight years ago, Local Food Hub has made strides in its mission to make fresh, farm sourced food available to everyone. Locally sourced food is now accessible to school kids and seniors, hospitals and universities, and restaurants and retailers. Community partnerships and programs ensure that we not only feed but also educate a new generation about the value of eating fresh and local. Family farms, the environment, public health, and the local economy all benefit as a result. Kristen Suokko maintains a wealth of experience in environmental philanthropy and nonprofit excellence, as well as environmental planning and sustainability. She began her career in Washington, D.C., working for the Natural Resources Defense Council and the U.S. Department of Energy. Kristen has lived in Charlottesville for over 15 years and previously held positions with the W. Alton Jones Foundation and the Blue Moon Fund. Kristen received a degree in Russian from Middlebury College and is from New England. Here’s how the hub works: partner farms and producers (small family farms and specialty producers) sell farm sourced food to the Local Food Hub which in exchange provides support services and resources to the food producers. The Local Food Hub then distributes the food through partner distributors, institutions retailers and schools. The Local food Hub also has partnerships with other community groups including nonprofits, hunger and food access organizations and farm to school. A third element of their services involves public education by increasing knowledge of local food to all segments of the community. For distribution, the Local Food Hub has a 3,000 square foot warehouse in Ivy, and three refrigerated vehicles. With over 200 customers the Hub has $1.5M in sales. The Hub assists more than 70 small family farms with Training and technical assistance, liability insurance, marketing, traceability, food safety and certifications. Community Partnerships include hunger organizations, PB&J Fund, City Schoolyard Garden, the Health Department and Crutchfield. The Farm to School program involves 70 public schools in eight districts, Harvest of the Month, Virginia Farm to School Week, and private schools and universities. The Fresh Farmacy program serves 75 patients in three clinics with measurable health improvements. Comments: Comments Off on Local Food – What Could Be Better?